Hello Friends, Hope this weekend is finding you well! It’s Saturday and time for our new challenge over at Just Us Girls! Vicki has a great one for us, she asked us to incorporate sponging onto our card and or project! I had such a fantastic time making this card! I decided to get out one of my neglected Gina K Design stamps to attack this challenge. (Out West 2) The waving wheat is a block stamp from Stampabilities. This card was made about a month ago for a very dear co-worker that retired and has a huge love of horses, as she has two herself. If you have any questions on how I made this, just let me know! You can also check out some videos like I did from the talented Theresa Momber, and she will get you started! She has so much talent! Please come on over to Just Us Girls and check out the rest of the cards from our very talented team and Guest Designer Carol Mayne. On a side note… My hubby and I took a red-eye home from Seattle Yesterday, so to say I am still a bit tired is an understatement. I don’t know about you, but I can’t sleep on airplanes. So between the 55+ miles we walked in a week’s time, the 3 hour time difference, and some serious jet lag (as the computer seems to be swaying) I don’t know which way is up. LOL Not to mention, saying goodbye to Ty always puts me in a tail spin for at least a few days. We had such a wonderful time with both Ty and Sandra (his fiance’) and hope it’s not to long before we are all reunited once again. Categories: Cards | Tags: Card making, Cards, Gina K designs, retirement, rubber stamps, silhouettes, sponging, stamping, Thinking of you | Permalink. Love your card – my daughter would love it too. Great scent with the horses. Fabulous job with the sponging. I absolutely love this scene you made with the sponging. Great color choices too. And, that is a favorite set of mine as well. This is so beautiful, Nancy. I love the colors. Glad to hear you had a great time visiting with Ty even though the weather wasn’t the best. OMG, Nanc’ this is amazing…your sponging is perfect and I love those silhouettes!! So glad you had a great time in Seattle! Let me know of your next trip and I will make an effort to come your way again!! Loved seeing you the first time!! What a gorgeous card! I love the silhouette of those pretty horses. I bet your coworker loved it! Glad you had fun in Seattle! Get some rest! This is amazing! I love the scene your have created by sponging and great choice of stamps. Absolutely gorgeous! Sponging is one of my favorite techniques. 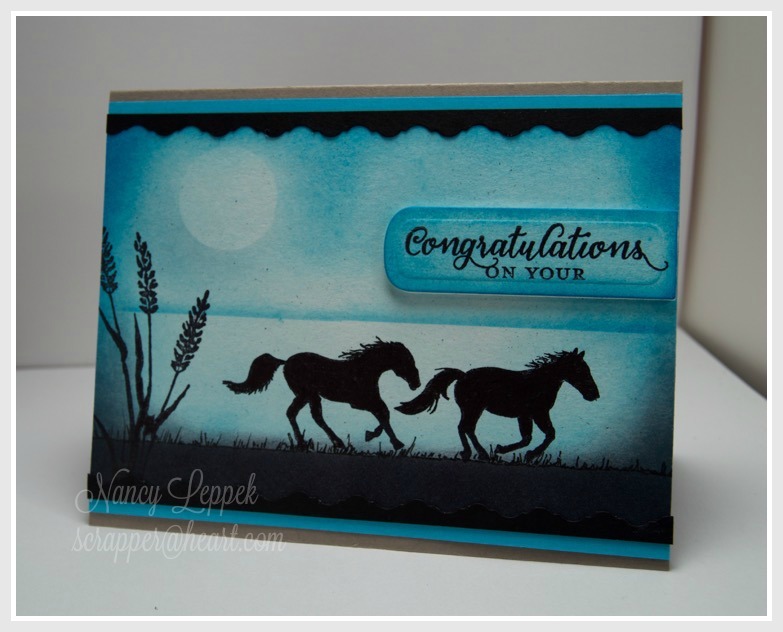 I love the silhouette of the horses in this midnight run that you created. You r sponging is fab! Sounds like your travels were filled with an abundance of activity…hope ‘balance’has restored! We’re in the midst of some travels ourselves: the third road trip in as many weeks…and more to come! Need to bring my ‘mobile crafting unit’ along next time! Your card: stunning! Gorgeous sponging for your striking silhouettes! So thrilled to be your GD for this challenge! GREAT sponging…..truth be told every time I need to sponge I head right on over to Theresa’s Blog too….she has a way with ink….like magical! I love the vibe of this card, it’s pretty cool! Beautiful take on the sponging challenge. I love your horses, and that beautiful blue color is perfect, really sets the mood. Gorgeous card! Your inking on this card is spectacular, Nancy. You even included a horizon line. The running horse silhouette is beautiful with their manes flying in the breeze.